The Supplemental Nutrition Assistance Program, or SNAP, provides critical support for Montana families to help put food on the table each month. By mid-April, Congress is expected to take up the Farm Bill - a wide-ranging piece of legislation that incorporates most federal agricultural policies, including SNAP. This bill is typically renewed every five to six years with bipartisan support and helps ensure all Americans can access the food they need. This year, however, Congress may consider significant cuts to SNAP which could harm Montanans across the state, from rural and urban communities to Indian Country. SNAP is a vital lifeline for families and individuals who have fallen on difficult times. But SNAP does much more than help households avoid hunger and get back on their feet – it also is an important boost to our agricultural economy. The Supplemental Nutrition Assistance Program (SNAP), formerly known as the Food Stamp Program, provides relief to low-income adults and families who have fallen on hard times. Eligibility is calculated based on gross monthly income, net income, and a household’s assets. A family of three would have to have an income of less than $26,600 a year to qualify for SNAP in Montana. Most adults without young dependent children (often referred to as able-bodied adults without dependents, or ABAWDs) have to meet additional requirements to qualify for SNAP. Unless they are working or in a training program for 20 hours or more per week, they are limited to receiving SNAP for three months out of every three years. In areas of high unemployment, states can waive this time limit. SNAP helps thousands of Montana families and individuals living in or near poverty. 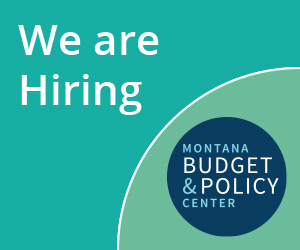 In Montana, 56,000 households, with a median income of $18,000, were participating in the program in December 2017., In any given month, an average of 116,000 Montanans receive benefits. Nearly half of households on SNAP are home to children under 18, over half have a member with a disability, and almost one-third have someone 60 years or older. American Indian households represent four percent of all Montana households, but ten percent of those households receive SNAP benefits. Moreover, one in every four American Indian households participate in the program, compared to one in ten of Montana households overall. The seven highest SNAP participation rates in the state can be found in counties with reservations within their borders. It is also important to note that the reservations experience exceedingly high unemployment rates. Glacier County, home of the Blackfeet Indian Reservation, for example, sees the highest SNAP participation rate in the state at 34.66 percent. Big Horn County, where much of the Crow and Northern Cheyenne Indian Reservations reside, follows with a rate of 33.49 percent. While the benefits are modest – the average Montanan receives $115 a month – they are a significant source of help for many families. SNAP is an effective program, and research has shown that it reduces poverty and improves nutrition. The majority of families participating in SNAP have a member of the household that has worked in the last 12 months. For workers who earn low wages, have inconsistent schedules, or are between jobs, SNAP provides an essential lifeline. In Montana, 39,000 workers lived in households that received SNAP last year. Thirteen thousand of these workers are in the service field, including a third of the cashiers in the state, one-fourth of personal care aides, and a fifth of cooks. With average wages between $10-$11 an hour, these workers are often unable to support families, especially those with children, elderly, or disabled members. SNAP’s benefit structure supports and encourages work. The program phases out benefits slowly – for every additional dollar a worker earns, benefits are only reduced by approximately 24 – 36 cents. Because benefits are not abruptly cut off, households can maintain a safety net while regaining their financial footing. In fiscal year 2016, SNAP benefits injected nearly $170 million into Montana’s local communities. While vital for thousands of Montanans, these benefits extended far past the families and individuals who used them to put food on their table. For every dollar spent through SNAP, $1.80 in economic activity is generated by increasing the amount of money people are able to spend on food, which frees up income to purchase other necessities. Ultimately, SNAP benefits not only families, but also local stores and farms. 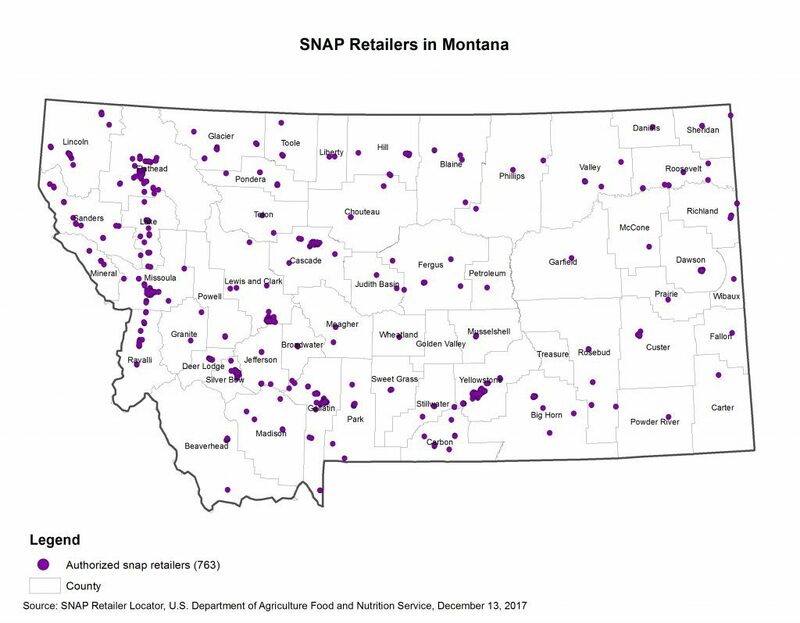 These dollars flow to the 763 retailers in Montana that accept SNAP, from local grocery stores and farmers’ markets to larger chain stores. Montana’s farms and ranches are another vital piece of our state’s economy. Every $1 billion increase in SNAP funding creates 9,000 full-time equivalent jobs across a variety of sectors, one in ten of which are within the agricultural sector. Additionally, this funding generates $92.6 million of agricultural production, and $32.3 million in increased economic activity (measured as an increase to agricultural Gross Domestic Product (GDP)). Cuts to SNAP would not only harm those receiving assistance, but it would harm thousands of workers in the agricultural sector as well. As Congress moves forward with the renewal of the Farm Bill, proposals to cut SNAP could have a significant impact on Montana families and our local economies. The Trump administration, and many in Congress, are calling for steep cuts and rule changes to SNAP, particularly for able-working adults. But harsher work requirements will not improve the lives of people on SNAP. The vast majority of SNAP participants are elderly, disabled, or children. The majority of those who do not fall into those categories are parents with children. Most participants who are able to work, do work. Work requirements in other programs have been shown to result in little to no long-term increase in earnings or employment. Harsher work requirements can disadvantage people living in high unemployment areas, as well as more remote, rural areas, where there is often a lack of jobs relative to the size of the working-age population. Cuts to SNAP do more than take food off of the tables of families who need help; they can also endanger Montana’s agricultural economy. Because SNAP helps millions of households across America purchase food they would not be able to otherwise, agricultural states like Montana that produce much of the country’s food, would be doubly hurt by cuts to the program. State of Montana. SNAP Program Overview. http://dphhs.mt.gov/hcsd/snap. United States Department of Agriculture. Supplemental Nutrition Assistance Program: Number of Households Participating (Data as of March 9, 2018). https://fns-prod.azureedge.net/sites/default/files/pd/30SNAPcurrHH.pdf. United States Department of Agriculture. Food and Nutrition Service. Profile of SNAP Households: Montana Congressional District (at Large). https://fns-prod.azureedge.net/sites/default/files/ops/Montana.pdf. While this report provides SNAP estimates using data from the United States Census Bureau (and therefore is lower than actual enrollment data from DPHHS), it provides a good snapshot of median income level of SNAP recipients. United States Department of Agriculture. Food and Nutrition Service. Profile of SNAP Households: Montana Congressional District (at Large). https://fns-prod.azureedge.net/sites/default/files/ops/Montana.pdf. United States Census Bureau. American FactFinder. FOOD STAMPS/Supplemental Nutrition Assistance Program (SNAP) 2016 American Community Survey 1-Year Estimates. https://factfinder.census.gov/faces/tableservices/jsf/pages/productview.xhtml?pid=ACS_16_1YR_S2201∏Type=table. Montana Department of Labor and Industry. Current Unemployment Rate. http://lmi.mt.gov/. Montana Department of Public Health and Human Services. State Fiscal Year 2018 Statistical Report, July 2017. https://dphhs.mt.gov/Portals/85/Statistics/documents/ProgramStats/July2017StatsBull.pdf. Calculations based on: United States Department of Agriculture. Supplemental Nutrition Assistance Program: Number of Persons Participating (Data as of March 9, 2018). https://fns-prod.azureedge.net/sites/default/files/pd/29SNAPcurrPP.pdf, United States Department of Agriculture. Supplemental Nutrition Assistance Program: Benefits (Data as of March 9, 2018). https://fns-prod.azureedge.net/sites/default/files/pd/31SNAPcurrBEN$.pdf. Dottie Rosenbaum and Zoe Neuberger. Center on Budget and Policy Priorities. Food and Nutrition Programs: Reducing Hunger, Bolstering Nutrition. August 17, 2005. https://www.cbpp.org/research/food-and-nutrition-programs-reducing-hunger-bolstering-nutrition. Brynne Keith-Jennings. Center on Budget and Policy Priorities. SNAP Helps Low Wage Workers in Every State. https://www.cbpp.org/blog/interactive-map-snap-helps-low-wage-workers-in-every-state. Center on Budget and Policy Priorities. Policy Basics: The Supplemental Nutrition Program (SNAP). https://www.cbpp.org/research/policy-basics-the-supplemental-nutrition-assistance-program-snap. Center on Budget and Policy Priorities. SNAP Is an Important Public-Private Partnership. https://www.cbpp.org/snap-is-an-important-public-private-partnership#Montana. Center on Budget and Policy Priorities. SNAP Retailers Database. https://www.cbpp.org/snap-retailers-database/#Montana. Estimates vary depending on the multiplier used, but increase agricultural jobs estimated at 765 – 1,000 jobs. United States Department of Agriculture. Economic Research Service. Economic Linkages: Supplemental Nutrition Assistance Program (SNAP) Linkages with the General Economy. https://www.ers.usda.gov/topics/food-nutrition-assistance/supplemental-nutrition-assistance-program-snap/economic-linkages/. United States Department of Agriculture. Economic Research Service. Economic Linkages: Supplemental Nutrition Assistance Program (SNAP) Linkages with the General Economy. https://www.ers.usda.gov/topics/food-nutrition-assistance/supplemental-nutrition-assistance-program-snap/economic-linkages/. Brynne Keith-Jennings and Raheem Chaudhry. Center on Budget and Policy Priorities. Most Working-Age SNAP Participants Work, But Often in Unstable Jobs. March 15, 2018. https://www.cbpp.org/research/food-assistance/most-working-age-snap-participants-work-but-often-in-unstable-jobs. Stacy Dean, Ed Bolen and Brynne Keith-Jennings. Center on Budget and Policy Priorities. Making SNAP Work Requirements Harsher Will Not Improve Outcomes for Low-Income People. March 1, 2018. https://www.cbpp.org/research/food-assistance/making-snap-work-requirements-harsher-will-not-improve-outcomes-for-low. Ed Bolen and Stacy Dean. Center on Budget and Policy Priorities. Waivers Add Key State Flexibility to SNAP’s Three-Month Time Limit. February 6, 2018. https://www.cbpp.org/research/food-assistance/waivers-add-key-state-flexibility-to-snaps-three-month-time-limit.